Second tip is this…don’t bake it for 30 minutes and toss and turn it a couple times. That’s too high maintenance and you STILL get the darkened and sometimes burned edges around the sides. This overnight method will keep your granola for browning too much or burning around the edge of the pan. AND you don’t have to turn and toss the granola while it’s cooking. So this is what it looks like before you bake it. See how I pressed the oats down into a thin-ish layer. I used the back of my plastic spatula to make it as even as possible. SEE!!! No dark, burned edges!!!!! I used my metal spatula to ‘scoop’ out the granola and break it into chunks. …this cute kid just wanted to say hi. Well, actually…he really wanted to photobomb the photo. And say hi. Which he succeeded in doing! 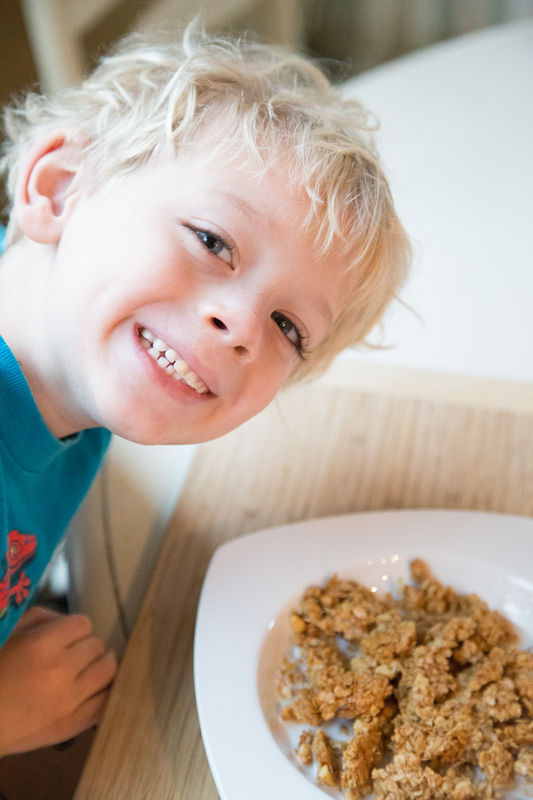 He downed this bowl of granola right after I snapped his photobomb, and then asked for more! P.S. Easy to make a gluten free version of this with the certified GF rolled oats and certified GF quick cooking oats! Preheat the oven to 325. Spray 2 rimmed cookie sheets with non-stick cooking spray. In a small mixing bowl, whisk together the melted butter or oil, honey and vanilla. In a larger mixing bowl, toss together the quick cooking oats, rolled oats, cinnamon, ginger and chopped nuts. Pour the honey mixture over the oat mixture and mix together. 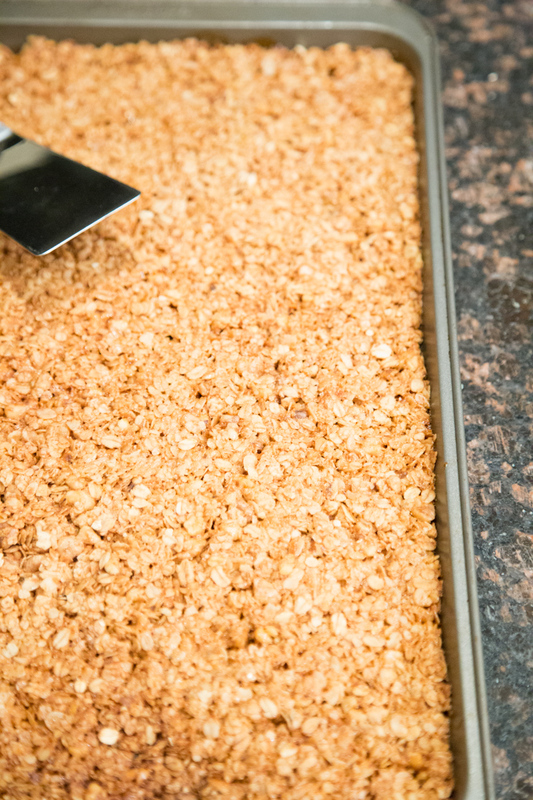 Spread the granola onto the prepared cooking sheets and press to cover the bottom. 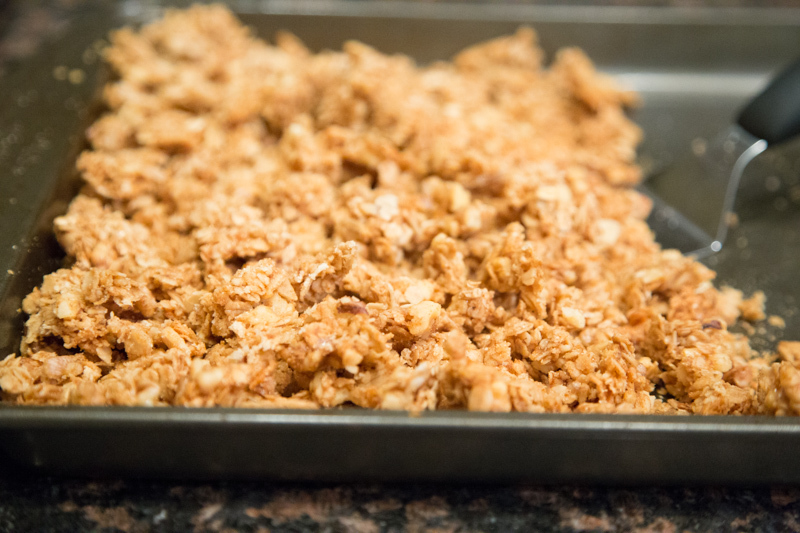 If there is a little empty space on the cookie sheet, that’s ok. You just want the granola not to be too thick in places and even all around, so it cooks evenly. Place in the preheated oven and bake for 10 minutes. 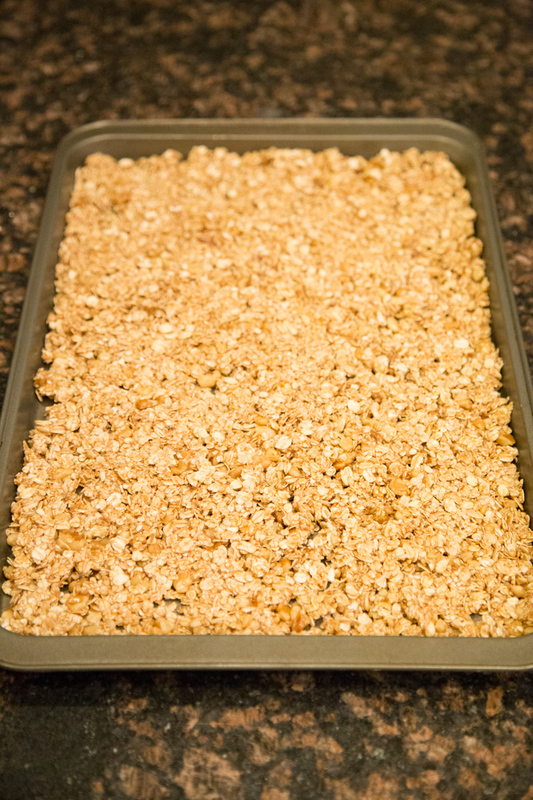 Then turn off the oven after 10 minutes and let the granola finish cooking as the oven cools down. It’s ready to eat the next morning. Use a metal spatula to loosen and break the granola into chunks for serving. Serve Overnight Granola with milk or yogurt and some fresh fruit. 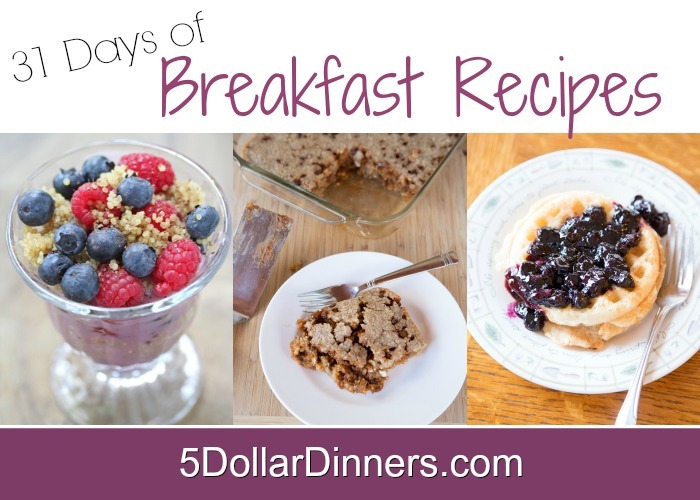 See all of our 31 Days of Breakfast Recipes here! What an awesome recipe, thank you! One question though….if you were to make this on a Saturday afternoon…how long would you let it sit cooling/baking? Thank you!!! I have the same question as Nikki. ALSO…as I live alone, do you think it would work to cut the recipe in1/2 and bake it in an 8×8 pan instead? Do you think you could use this method with any granola recipe? I love granola, but if I cook it in the oven I always burn it and I don’t like the way it comes out when I use the crock pot method…your method would be perfect if I could use it with other recipes and flavors, like your pumpkin pecan granola recipe. Thanks much for your blog, it is one of the few I am still following since I first started following blogs years ago. I made this last night and added 3/4 cup nutella in with the melted butter (while it was hot), honey, and vanilla, whisking untill mixed. It turned out fantastic. I will never make granola any other way again! Thanks so much for sharing this recipe with us Erin. 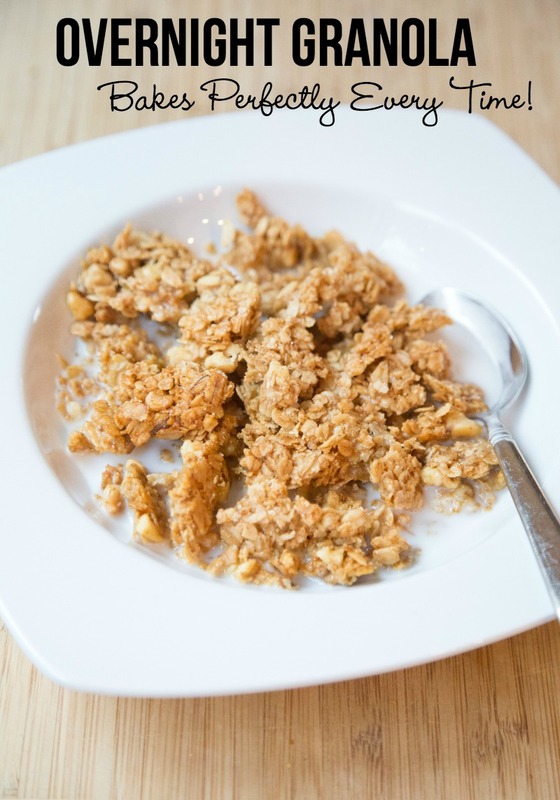 I can’t wait to try this granola recipe! We eat granola or oatmeal about 4 times a week and it does get pricey. Our granola that we eat is Oats N Honey with Protein (the $4 a bag for only 11 oz stuff). Should I not add the cinnamon and nutmeg to get the same flavor? What would you use to achieve the same 10g of protein? Any way to make this into granola bars too? If I could get this as close to the granola we eat now I might never buy it again! Thank you so much and I appreciate your recipes. You have definitely helped a lot of people. Erin, and everyone, I just made this last night. I price check the local stores around here and as my luck would have it everything I needed was on sale. So I got all the ingredients for very cheap (oatmeal was 2 for $3, spices were 4 for $5, the mini spices, honey was $2.88, butter was $1.88). I’m guessing I can make about five batches with the ingredients I have. One batch filled up a half gallon ziplock bag. That’s a lot more than the other store bought brands. The granola was crispy but soft at the same time. Not overly dry. Broke apart easily. I could maybe even make bars out of it! Was great alone or in a bowl with milk. One serving fills you up! Great healthy energy. Very filling. Perfect texture. Great recipe! And the best part- it was really easy to make! For about $13 I could make 5 batches easily. My previous granola was $4 for 11 oz’s. You were lucky getting it for $3.50. What I really love about this is my kids LOVED it- and it was so easy I might adjust the spices and add chocolate chips to try to make bars. This was a very good recipe and I appreciate you sharing it! Can’t wait to try your others. Thank you Erin! So I made this at about 8pm, and it smelled so absolutely heavenly that I almost snuck a piece at 10pm, but I didn’t. I added peanuts, sesame seeds, and raisins and it was absolutely divine the next morning at around 7:30am. I’d like to make a bunch because I’ve got a teenager who is always starving. How long will it store in an air tight container?